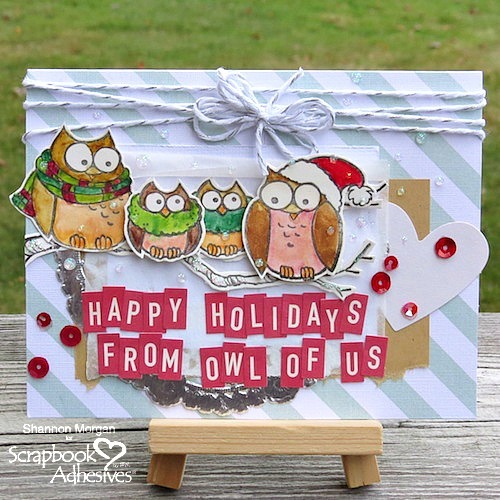 We hope you are enJOYing our week-long blog hop with Stampendous on Day 3! What are your favorite tips, techniques or projects? Keep reading to see what Teri Anderson and Shannon Morgan bring joyful inspiration to us today. Hi, everyone! I’m excited to share with you a card perfect to send this winter to a special someone with the adorable CLD12 Snowman Cardinals Cling Stamps and Dies from Stampendous! I wanted this card to have dimension so I embossed, colored and die-cut the snowman, cardinal and trees from cardstock. I adhered the snowman and cardinal to my card with 3D Foam Squares and Thin 3D Foam Squares. If you look closely, you’ll see the cardinal pops a little higher off the card than the snowman. That’s because I used the 3D Foam Squares to mount the bird to the card and the Thin 3D Foam Squares to adhere the snowman to it. Using these two adhesives together is the perfect way to add levels to your cards and scrapbook pages! Speaking of the snowman, don’t you just love his playful nature? I felt like he would be right at home with a few snowballs so I made some! It was easy with 3D Foam Circles. I simply placed several of them on a paper piercing tool and dipped one side of them in embossing powder. I heated up the embossing powder with a heat gun until it was completely melted and then I placed the circles right onto the card. So fun! Thanks for checking out my card! 2018 Blog Hop with Stampendous – Day 3. If you cannot see the comment section (at the bottom of this post), please CLICK: Joyful Inspiration from Stampendous – Day 3 and scroll down to the bottom of the post. This entry was posted in 3D Foam Circles, 3D Foam Squares, Adhesive Dots & Lines, Adhesives, Announcement, Cards, Crafts & Tutorials, E-Z Runner® Dispensers, E-Z Runner® Grand, Intermediate, Permanent Adhesive, Seasonal Craft Ideas, Skill Level, Wear your Adhesive on the Outside, Winter and tagged 3D Foam Circles White Mix, 3D Foam Squares Mix White, 3D Foam Squares Regular White, 3D Foam Squares Small White, Adhesive Dots Mini, Blog Hop, E-Z Runner Grand Dispenser, E-Z Runner Grand Permanent Strips Refill, E-Z Runner Permanent Strips, E-Z Runner Permanent Strips Refill, E-Z Runner Permanent Strips Refillable, Embossing Powder, Giveaway, Heat Embossing, Shannon Morgan, Stampendous, Teri Anderson, Thin 3D Foam Squares White, Wear Your Adhesive on the Outside. Bookmark the permalink. 23 Responses to "Joyful Inspiration from Stampendous – Day 3"
Adorable cards. Love the snowman and the owls. Darling cards! This is a great match up! run. Both cards are so sweet!! 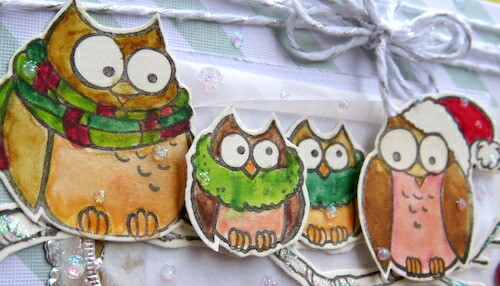 I LOVE the snowman stamp set and your owl card has so many fun layers! Cute cards. I like the sparkly snowballs on the first one. I love both stamp sets! The owls are so cute! Very fun cards! I love the snowman and the cute owls! I love adding dimension to my cards with the 3D Foam Squares! I love the snowballs on the first card and the second card is “owl”-some! The owl family is darling. Love the play on words in the sentiment. The scene with the snowman is fun. WOW… they are super adorable cards. Adorable and fun cards! So many creative details. The snowman and owls are both adorable- thanks for sharing! Wow there’s so much cuteness!!!! Love the snowman and owls!! Wonderful cards! I enjoyed the cards in today’s post. 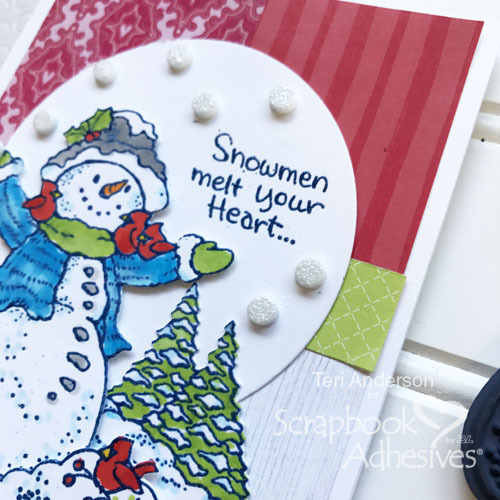 The circle dots with the glitter on the snowman card make a fun embellishment. Great inspiration to get going on my Christmas cards! The whimsical illustrations on the snowman set are fantastic and the owl family is os adorable.